Western fans of Japan’s epic scifi anime Legend of the Galactic Heroes have been waiting decades for an official English release. They’re finally getting one this year, but that’s not all! The original novels by Yoshiki Tanaka are coming too, and io9 has an exclusive preview. 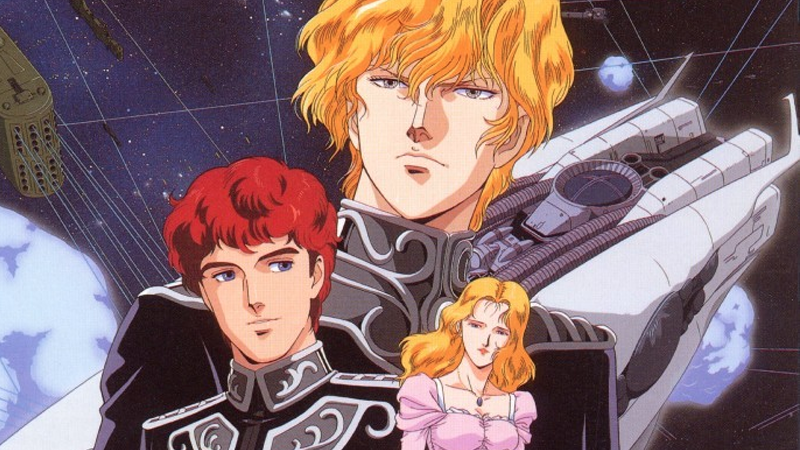 Legend of the Galactic Heroes began as a sprawling, 10-novel scifi series released between 1982 and 1987 in Japan. The books told the story of two rival military commanders in the far future, Reinhard von Lohengramm and Yang Wen Li, and their clashes as part of a bitter interstellar war across the Stars between Galactic Empire and the Free Planets Alliance. The series exploded in popularity when it was adapted into animated form, but neither it nor the books ever managed to come to the West. That changes on March 8, when Viz Media releases the first three novels (followed by an eventual release of the anime by Sentai Filmworks). Interested checking out in Japan’s pre-eminent space opera? We have an excerpt from the first novel “The Battle of Astarte”—the very first look at Legends of the Galactic Heroes’ long-awaited Western debut! Whether that order came before or after, no one could tell. A flash of light strong enough to make people think their retinas had been fried stole the vision of all who were on the bridge. With a lag of half an instant, Patroklos’ body was jostled by an explosive burst of energy, then tossed and turned in every direction. Noises of things falling over and objects colliding overlapped with the screams and shouts of anger. Not even Yang was able to avoid falling down. He took a hard blow to the back and had the wind knocked out of him. As his helmet communicator picked up a chaotic jumble of noises and voices and a fierce flow of air from the surrounding area, Yang straightened out his breathing and covered his sightless eyes with the palms of his hands—protecting them, albeit after the fact. And who needed a dressing-down over that one? Failing to adjust the screens’ photoflux capacity was not an easy blunder to forgive. If this kind of thing kept happening, it would be a wonder if they didn’t lose. At last Yang opened his eyes. An emerald fog hung over his whole field of vision. He sat up and noticed the person lying next to him. A thick and sticky, deeply hued fluid covered everything from his mouth down to his chest. “Commander,” Yang said in a low voice, staring closely at the vice admiral’s face. He planted both his legs firmly and got to his feet. A fissure now ran through one section of bulkhead, and the air pressure was dropping rapidly. It looked like a few who hadn’t had their magnetic boots switched on had been sucked out. The opening, however, was being rapidly sealed by a vaporized bonding agent blown against it from the self-repair system’s operations gun. Yang looked around the bridge. This was a mess; hardly anyone was still standing. After confirming that his helmet communicator still worked, Yang started giving out instructions. He took another look around the bridge. “Lieutenant Commander Lao, of the staff officer team.” The small-eyed, small-nosed face peeking out of the space suit’s helmet looked about the same age as Yang. In addition, two astrogators and one operator raised their hands and stood, but that was all. Yang slapped his helmet over where his cheek was. The Second Fleet’s leadership had been essentially wiped out. A naval surgeon came running in with a team of paramedics. Quickly and efficiently, they checked out Vice Admiral Paetta and told Yang that a broken rib had punctured his lung when his chest slammed into the corner of a control panel. “He’s had some pretty bad luck,” the doctor opined unnecessarily. On the other hand, one couldn’t deny that Yang’s luck had been good. “You’re the highest-ranked officer who’s still in one piece. Show me...what you’ve got as a tactician...” The vice admiral stopped speaking suddenly—he had lost consciousness. The navy doctor called a robot car that served as an ambulance. “He thinks highly of you, doesn’t he?” said Lieutenant Commander Lao, impressed. Lieutenant Commander Lao, unaware of the clashes of opinion between the vice admiral and Yang, gave a doubtful glance at that answer. Yang walked over to the comm board and flipped on the switch for external communication. It seemed the machines were built more sturdily than the people. “Attention, all ships. This is Fleet Commander Paetta’s next-in-command, staff officer Commodore Yang.” Yang’s voice raced through the empty spaces, piercing the void. Here he paused for the space of a single breath, giving his comrades the time they needed to recover from the shock. Hoo-boy, even I’m talking awfully big. Yang was smiling wryly, but only on the inside; he didn’t let it come to the surface. In the position of commander, you had to puff out your chest even when you felt like hanging your head. Through Kircheis, Reinhard’s order was transmitted to every vessel in the imperial force. But for his helmet, Yang would have taken off his beret to scratch through his black hair at that moment. When there was little difference in force strength, the most effective tactic for the attacking side was either the frontal breakthrough or the partial encirclement. He’d been guessing they would choose the more aggressive of the two, and it looked like he’d managed to hit the nail on the head. Lieutenant Commander Lao glanced forlornly toward Yang as he provided his commentary. The faintheartedness in the alliance force—of which Lao’s expression was representative—was the real fruit of the empire’s aggressive tactics, Yang reflected.